If your refrigerator has a "Change Filter" light, reset it. LGUS2642LF1, LGUS2642LE0, LGUS2642LE1, LGUS2642LE2, LGUS2642LF0. [Brand Effect]: The true Pureza WF3CB compatible for Frigidaire, Electrolux, Sears and Kenmore refrigerators. NOT TO BE CONFUSED with filter ULTRAWF, which is longer. 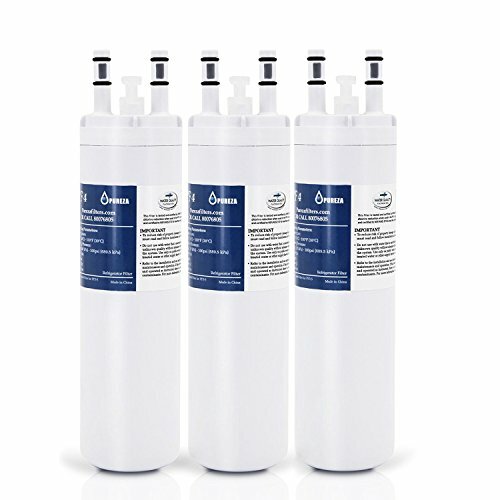 This is the Replacement Filter for Pure Source 3 (WF3CB) which is 9 inches in length. [Compatible for Frigidaire / Electrolux Filter Model / PartNumbers]: Compatible with Frigidaire Puresource 3 (WF3CB) and AP4567491, PS3412266, 012505452185, 242069601, 242086201, 706465, 85075-SGP-001. [Efficient Filtration]: Organic carbon block triple filtration technology to reduce the chlorine and peculiar smell, reduce it can reduce impurities such as lead, iron, mercury and other pollutants, keep the minerals in the water, ensure that the refrigerator filter, high-quality water, and ice. [Charitable Projects]: Pureza WF3CB Improve Your Drinking Safe and Healthier with New Technology, Our Products are Backed by a Life Time Guarantee, Each of Your Orders Will Take Part in Our "Handling Water Pollution" Philanthropy Program to Make Children in More Remote Places Drinkable Healthy water We thank every participant for his contribution. If you have any questions about this product by Pureza filters, contact us by completing and submitting the form below. If you are looking for a specif part number, please include it with your message.